I’ll admit it, I definitely don’t drink enough water in the day. Even though I get dehydrated really easily, I’m just so bad about making it a priority. Water just doesn’t do it for me. It’s so…blah. I am a big fan of herbal teas in the winter but want to actually cut back on my pop addiction. Last week I finally caved in and bought a water infuser from Amazon. At $19.99, I knew it would be a good investment since I love natural fruit flavored water. One of my favorite things at going to get my hair cut in Minneapolis is the spa water filled with fresh orange, limes, lemons, and other seasonal fruit they serve. So refreshing! It has flavor but isn’t over the top sweet. All you have to do is add cut up fruit in the rod (I know, sounds dirty), fill the pitcher with water, and ta-da! You are set! The rod allows the flavors to get in the water without big chunks of fruit getting in it. My first concoction? 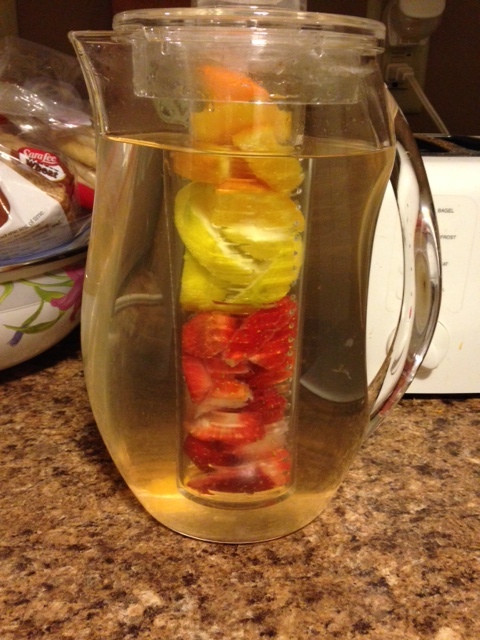 A simple strawberry, orange, and lemon mix! I can’t wait to try different herbs and fruits! Anyone else have a water infuser? Water not good enough for you?? ?